In this section named 'Beauty and Health' there are 7 pages and the links to those pages can be found on the left hand side menu under the main title, 'Beauty and Health'. The section looks at the multiple uses for vinegar in both beauty and health applications. 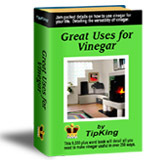 Great uses for vinegar is constantly being added to with new tips about beauty and health being added all of the time. On the same left hand side menu have a look at the 'More Vinegar Tips' section. In that area are two categories called Vinegar tips for beauty and Vinegar tips for health, both of those categories have new tips being added on a regular basis.